PARTIES - Every child's dream! Want to host a birthday party with a difference ? "TrailBlazers" is now available in Sydney. A fantastic opportunity for your child and their friends to experience the thrill of riding a motor bike under safe supervision. Have a child's birthday party that provides excitement and fun while also helping them to acquire riding skills and gain self-confidence. All that's required to start is an ability to competently control a push bike and a desire to learn. The children will be introduced to the wonderful experience of trail bike riding by Mike who has 25 years riding experience. 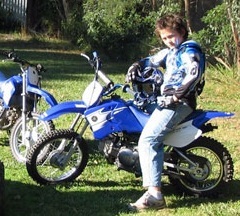 All our equipment is state of the art and Australian standards compliant, and we use Yamaha bikes and Polaris quads. Children need to be aware of the importance of listening and heeding the supervisors for their and their friends' safety. Safety gear will be provided. Appropriate clothing must be worn: Jeans, Boots or joggers, long sleeved t-shirt and footy/soccer socks. We recommend a maximum of 8 children per two hours to ensure each child has enough time riding and they arent kept waiting around. Dont be disappointed - book early. Length of time We recommend 2 hours to ensure each child has enough time riding and they arent kept waiting around. Childrens behaviour The children will be taught how to treat the equipment and how to behave on the bikes. 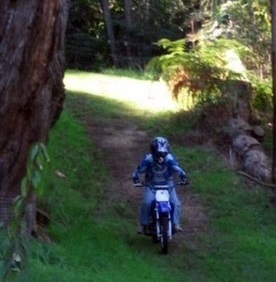 Any misbehaviour will result in that child not being allowed back on the bike. This is for the child's own safety as well as that of the other riders.